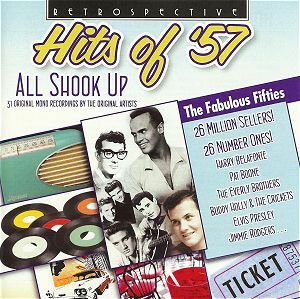 Hits of ’57: all shook up – 26 million sellers! 26 number ones! Buy through MusicWeb for £7.00 postage paid World-Wise. As we all know, Nostalgia is very much a thing of the past. In fact it’s such a thing of the past that Nostalgia could be considered to be another country (with apologies to L P Hartley). What doesn’t seem right is when a disk like this one comes your way and it celebrates a year within ones own lifetime. My own life has become the stuff of nostalgia – it’s no wonder my kids think of me as an old fogey. This is a wonderful compilation and I enjoyed almost every minute of it. Apart from 1957 being the year when Kerouac’s On The Road was published it was also the year Sibelius and Dorothy L Sayers, amongst others, died, and the year that West Side Story burst onto the Broadway stage. We’re only three years after Bill Haley and His Comets recorded the seminal rock’n’roll disc Rock Around the Clock and it’s amazing how quickly popular music had developed in that time. Here we’ve got a variety of tracks, ballads, rockabilly and early rock’n’roll sitting easily side–by side and interacting with one another. Not all the songs are of the first magnitude and a couple of the singers now leave one wondering quite how they achieved fame as vocalists but here’s 1957 laid musically bare, and it’s rather exciting. The three from the King – Jailhouse Rock (the only entry in this collection by the great Lieber and Stoller) which achieved 7 weeks at No.1 the same as Teddy Bear and two weeks less than All Shook Up – show both ballad and hard edged rock and it’s fascinating listening to these tracks together to realize than Elvis could do the raunchy number as well as the ballad with equal success. Try that today Kaiser Chiefs! Tab Hunter – studio boss Jack Warner was to create Warner Bros Records specifically for Hunter – and Pat Boone were both actors as well as singers and Boone has, over the years, sold over 45 million albums and achieved 38 Top 40 hits, as well as starring in over 12 Hollywood films. Paul Anka’s first single, I Confess, was recorded when he was only 14! Diana, written when he was 16 years old, brought him instant stardom and is one of the biggest selling records in popular music history, despite starting with the immortal line “I’m so young, you’re so old…” I’d never heard Andy Williams’s recording of Butterfly and it’s interesting that there’s a nod in Elvis’s direction both in the vocal and the accompaniment. The death of Buddy Holly coined the line the day the music died, inspiring Don McLean’s song American Pie, and it’s easy to see why. Holly was a personable young man, who, according to critic Bruce Elder, was "the single most influential creative force in early rock and roll." Even though he only had a career lasting about 18 months! Everybody knows Holly’s two songs recorded here Peggy Sue (which everybody tries to copy because of the famous glottal stop he employs) and That’ll Be the Day and they’re a marvellous example of the way the band line–up was progressing. Debbie Reynolds is the all–singing, all–dancing young girl co–star from Singing in the Rain. Tammy is the Jay Livingston title song for Tammy and the Bachelor (the first Tammy film) and this was one of the first records I ever owned – my parents bought me a 78rpm disc of it, I often wonder why. It has a gorgeous accompaniment by Joseph Gershenson and his Orchestra. If Tammy seems a backward look in popular music, the Everly Brothers bring us right up to date. Their two songs, Bye–Bye Love and Wake Up, Little Susie are country music influenced rock songs, again with a minimal accompaniment. It’s sad that many people will only know these songs by the performances given by Simon and Garfunkel at the justly famous 1981 Concert in Central Park for, good though they are, this is the real thing, hard edged and brilliant. Harry Belafonte was named King of Calypso for popularising the Caribbean musical style. Banana Boat Song was his biggest hit and became his theme song. My problem is that I can no longer hear this song without hearing Stan Freberg’s brilliantly satirical version – which Belafonte hated. Jimmie Rodgers learned music from his mother, learned to play the piano and guitar, and formed a band while he served in the USAF. Honeycomb was his first big hit, achieving 4 weeks at No.1, and together with Kisses Sweeter Than Wine he gives pop hits a nice C & W twist. “Fats” Domino’s up–tempo cover of the 1940 hit Blueberry Hill was No.1 in the R&B charts for 11 weeks and sold more than 5 million copies worldwide. Johnnie Ray, variously known as The Nabob of Sob, and The Prince of Wails, delivers an highly powered performance of Yes Tonight, Josephine but can you really take this song seriously? Having been put in a relaxed mood in crashes The Killer with the very basic Whole Lotta Shakin’ Goin’ On. It’s electrifying. I love the story about Lewis being expelled from school for playing a Boogie woogie version of My God is Real at a Church assembly. Years later Pearry Green (who was president of the student body at the time of the incident) asked Lewis if he was “…still playing the devil's music?" to which Lewis replied "Yes, I am. But you know it's strange, the same music that they kicked me out of school for is the same kind of music they play in their churches today. The difference is, I know I am playing for the devil and they don't." Buddy Knox was born in Happy, Texas and he recorded Party Doll in the same studio Holly recorded That’ll Be the Day. With Lonnie Donegan we come home, real home–spun skiffle, as raw and elemental as anything in early rock’n’roll. I’d forgotten just how good Frankie Vaughan was. He had a fine voice and he knows how to deliver a song without histrionics – at least at this time in his career. Johnny Duncan was another skiffle musician, and this up–tempo version of a calypso tune, Last Train To San Fernando, became the seventeenth most popular recording of that year in the UK. Nat King Cole came to prominence as a jazz pianist but he was also gifted with a voice of velvet hue and it’s his singing of ballads by which he’s remembered today. I’ve enjoyed this selection not least for the memories it evokes but because it’s music in a state of flux, between rockabilly and rock’n’roll, music which is finding its feet only to loose its footing with the next new invention. Important both as an historical document and as entertainment. A nice stocking filler I think. All I can add to what I have written is A–Wop–bop–a–loo–bop a–lop–bam–boom.